Each workshop is a complete class and is suitable for all - from beginners to experienced stitchers. No previous knowledge or experience of fabric manipulation is required. Most students will achieve the selected project to a stage where the final quilting and binding can be finished at home. Sewing machines are used but you don't need the latest 'techno-computerised' model, any machine will do! Intriguing yet simple design from squares and rectangles. 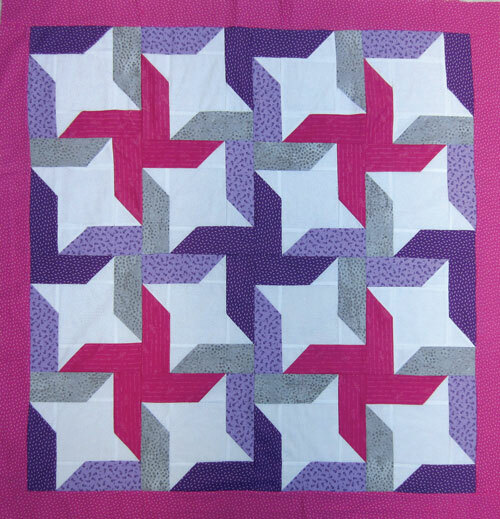 Play with shape and form then roll and fold to create a delightful textured starry block. Make one with a scalloped border embellished with Trumpets or go large and make four with or without a scalloped Trumpet border. For quilts. cushions, wallhangings and bags, this new class from Foldy Rolly Patchwork Pzzazz is a wow. Ideal for all abilities. It’s a tactile twiddle for fiddly fingers! NEW Class: Boxes, Bits and Bobs! 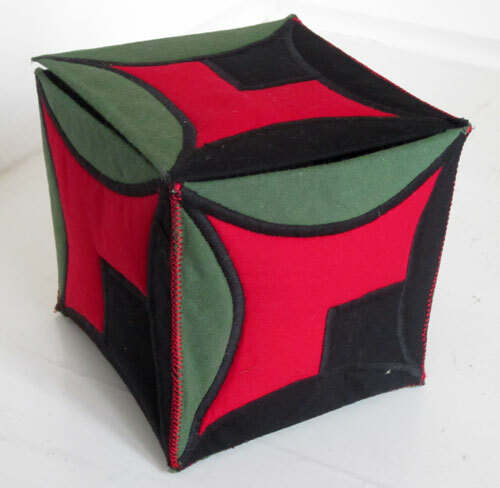 Explore the possibilities of shape, form and pattern to create a uniquely different box or boxes. Experiment with satin stitch and discover some tricks of the trade to produce professional results. It's fast, fun and totally rewarding! Add a flower or two, embellish with fancy folded hexagons or turn these delectable designs into further 3D tactile twiddles. NEW Class: 3D and Hexagonal Happenings! From triangles, diamonds and hexagons create a multitude of 3D and diametrically different designs - play with the pieces. Conquer those tricky Y seams or cheat at construction - it’s Jennie’s magical methods with material. Does it need a Button? Take squares and rectangles and combine for a fancy 28" square panel - ideal as a hanging or centre of a quilt. Alternatively make the design up in two smaller squares for a bag or decorative cushions. easy to sew yet looks deceptively difficult. Another class from the fiddly fingers of the Calico Queen Jennie Rayment. Experiment with these delectable, textural and tactile circular designs. Tuck, twist and twiddle the pleats for a stunning square or circular wall-hanging, cushion or quilt centre. Embellish the tucked edges with stitch or yarn, Add an interesting textured edging and binding, some decorative stitching. Mount the panel onto a background fabric, add some textured inserts. It will will then be ready for machine quilting - free or otherwise. 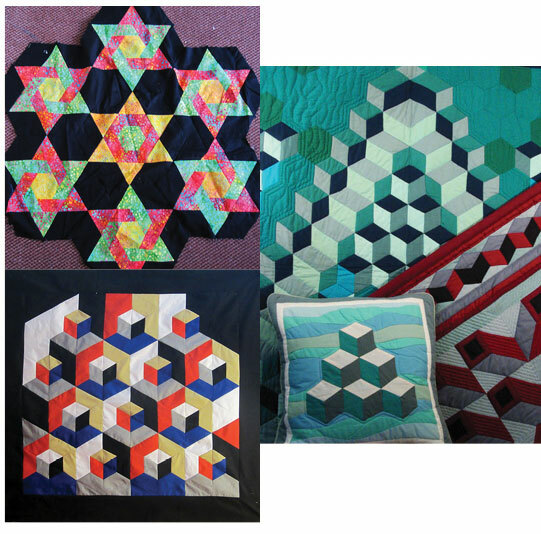 Create a cushion, bag or quilt panel from folded and manipulated squares. Many different variations on design arrangement yet Oh sew easy to construct. It's tactile texture for all with fiddly fingers who enjoy a little fabric manipulation. Learn piping and zip insertion techniques and make a cushion or explore Jennie’s special speedy methods to make a bag. Great class for all those who fancy a little fabric fun. Make two panels for use as cushions, bag panels or as quilt blocks. Ideal for those taking their first steps into the world of fabric manipulation and textured designs. Excellent for all who also need to know how to use thier sewing machine - a wealth of knowledge on how to use your sewing machine is proffered in this class. Plus nifty tricks on rotary cutting straight and bias strips are all included - great for all beginners! Scrabble in your fabric stash and fish out oddments of material! A most excellent way to combine a series of coloured scraps or memorable materials into an attractive hanging/table runner/small quilt. 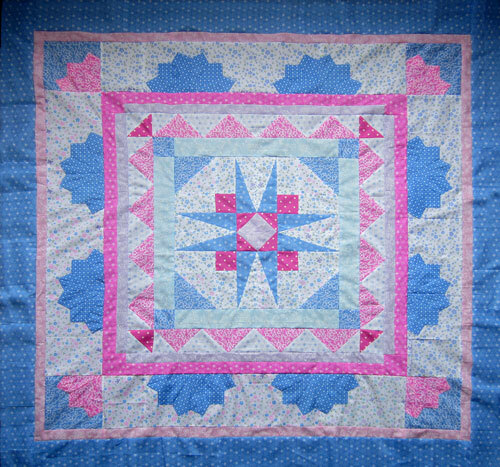 Design from Jennie’s book ‘Foldy rolly Patchwork Pzzazz’. Create your own original landscape using hand/microwave dyed fabrics or any other materials. Discover the textural niceties of scrunching tucking, folding, inserting and pleating for a dynamically 3 D unique creation. Creative play for all - twiddle and fiddle your way through a wide range of manipulative machinations. No artistic ability required - just have fun - it can’t go wrong but will just be a little different! Why not take this class with ‘Texture into Sudoku’ and create 15 different ways to magically manipulate material? Easy ways to create simple bags from shopping to hand, embellished to plain, Scrip to Sling and Origami to original – indeed all sorts of bags for many different occasions. Every student will produce make three basic bag techniques plus one or two more from a range of delectable designs and patterns. A must for all bag-bods - t’is fast, fun and Oh sew simple!! Experiment, embellish, embroider and enhance a multitude of twiddled tucked designs. Play with appliqued threads and creative decoration, explore shapes, patterns and structures from 'Honeycomb' to 'Twice Tucked and Twisted'. Amazingly simple yet so so sew effective! Totally tantalisingly tasteful - most excellent ideas for garments, quilts and accessories. An ingeniously innovative 3D circular sunflower-like design packed with nifty notions for tactile and textural manipulation. Easy to assemble - no awkward templates - just Jennie's specially simple novel piecing technique. Nine ingenious ways to create surface texture and manipulated magic. Create all nine ideas in class and combine to create an amazingly marvellously nipped, tucked, twiddled and fiddled panel with a little added extra embellishment. 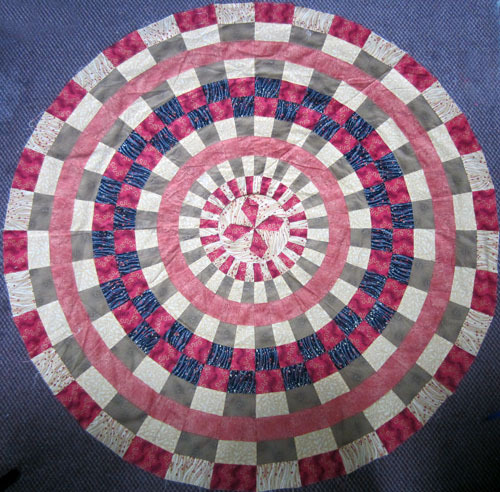 See Gallery for the completed quilt. DVD available for this workshop.